His name is Bill. He has wild hair, wears a t-shirt with holes in it, jeans, and no shoes. This is his entire wardrobe as he goes to college. He is very, very bright. He became a Christian while attending classes. Across the street from the campus is a well-dressed, very conservative church. They want to develop a ministry to students, but are not sure how to go about it. One day, Bill decides to worship there. He walks in with no shoes, wearing his jeans and t-shirt, with that wild hair. The service has already started and so Bill starts down the aisle looking for a seat. The church is completely packed, and he can’t find a place to sit. People are looking a little uncomfortable, but no one says anything. Bill gets closer and closer to the pulpit, and when he realizes there are no seats, he just squats down right up front on the carpet. (This is fine for college fellowship, but trust me, this has never happened in this church before!) By now the people are really uptight, and the tension in the air is thick. The preacher looks up and sees that from the back of the church, a deacon is slowly making his way toward Bill. Now, the deacon is in his eighties, has silver hair, and a three-piece suit. He is a godly man, very elegant, very dignified, very courtly. He walks with a cane, and as he starts walking toward this boy, everyone is saying to themselves that you can’t blame him for what he is going to do. How can you expect a man of his age and background to understand some college kid on the floor? It takes a long time for the deacon to reach the boy. The church is utterly silent except for the thumping of the man’s cane. All eyes are focused on him. No one even breathes. The preacher can’t preach the sermon until the deacon does what he has to do. And, now, they see this elderly man drop his cane on the floor. With great difficulty, he lowers himself and sits down on the floor next to Bill so he won’t have to worship alone. When I first read this story, it brought tears to my eyes. It still does. It brings a lump to my throat to think of how much like Jesus the deacon in this story has become. Jesus loves people! Jesus loves all people! Jesus looks at all of us with the eyes of love. Jesus sees beyond our outward appearances and all of our disguises, and knows and loves us as we really are. Jesus gets down on the floor with us so we don’t ever have to be alone. Come. Let’s learn how to love each other that much…together. This year our evening Lent programs will have a church “family” focus. We hope that you will use this time as an opportunity for new beginnings as we grow in faith. Middle school and high school youth will have the opportunityto explore God’s word through a video lesson. A fellowship meal will begin at 5:45 pm each Sunday evening. The meal on February 21st will be pizza and salad. A sign up sheet for drinks and desserts will be available on the entrance table in the education building and church building. There will be five Lenten Sunday programs beginning onFebruary 21st and ending on March 21st. Ash Wednesday Pancake Supper – February 17th! 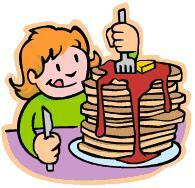 Come join us for Zion’s Annual Pancake Supper! Dinner will be served from 5:15 p.m. through 6:15 p.m., followed by our Ash Wednesday Communion Service at 7:00 p.m. There is no cost for the dinner but we will be accepting donations for the Lutheran World Relief effort for the crisis in Haiti. Circle of Friends is organizing this event with lots of help from the other women’s circles. Come join us for a time of fellowship followed by the Ash Wednesday Communion Service as we prepare our hearts for Lent. Author pastorPosted on January 28, 2010 Categories UncategorizedLeave a comment on Ash Wednesday Pancake Supper – February 17th! As we begin a new year, with your help, we can make 2010 a great year for our children’s choir at Zion. If you have a child in kindergarten – 5th grade, please consider enrolling them in the choir. Heidt at 728-3288, if you need help in transporting your child to practice. We thank you, and ask the congregation for your continued support and prayers as we grow in our ministry with the children at Zion. Scout Sunday will be celebrated February 7th at the 11:00 a.m. worshipservice. The Scouting program, promoted by our Lutheran Church Men,will be recognized and members and leaders will process as part of theservice. The Scout organization at Zion enjoys a very active group ofleaders and participants. Zion appreciates the dedicated Boy and GirlScout leadership and members! Souper Bowl Sunday is coming up February 7th. The Youth will have a Soup Pot for donations to go to feed the hungry through Manna House ministry. We installed Church Council members yesterday during worship, and it was Unity Sunday. We had guest musicians on piano and violin to play for the service from Guyton United Methodist Church, with whom we have just come into full communion with (press release), and it was a joyful celebration. Lutheran Men in Mission sponsored breakfast last Sunday! Lutheran Men in Mission sponsored a Sunday Breakfast, and it was delicious! About 25 people came, for eggs, grits, sausages and biscuits before Sunday School. We plan to have it again February 28th. Everyone plan on coming early to church on February 28th and have a delicious warm breakfast and learn what exciting things we have planned for Sunday School this year. Author pastorPosted on January 25, 2010 Categories UncategorizedLeave a comment on Lutheran Men in Mission sponsored breakfast last Sunday! Alex Peth, Katherine Ralph, Matthew Ralph, Katie Pittman, Amber Hall and Dana Lee Smith enjoyed learning more about Manna House Ministries and helping out with Manna House’s first Saturday shopping day. Many thanks to all who went Christmas caroling and shared some holiday cheer with our homebound members. Thanks to the Effingham chapter of Thrivent for providing money to purchase items for care packages that were distributed to homebound members. After caroling we enjoyed dinner with our 80 year old and over friends at the church. Thanks to all who helped with this delicious meal! Come explore God’s word and join us for some fun! Youth and parents are asked to meet in the education building immediately following the worship service. All GA information and forms will be distributed (see additional information below). Parents, please come prepared to fill out a new health form. Youth group members will elect 5 youth to serve on the Youth Planning Team. The team consists of 5 youth and 5 adults. The team provides leadership to assist in selecting activities and projects. Qualifications for youth team members are as follows: regular participant in Sunday School and Worship and active in Sunday and Wednesday programming. All the names of eligible youth are posted in the youth room. All previous members and newly elected members are needed for this meeting! Church officers will be installed during the service. Youth elected to serve on the planning team will also be recognized. Youth Sunday will be on February 7th. The youth will collect donations and participate in the “Souper Bowl of Caring” again this year. This is an opportunity to gather with other Lutherans from around the state for a weekend of spiritual growth and fun filled worship. The theme for this year’s event is “Keep it ‘Tov” and it is based on Genesis 1. When God saw what had been created, God saw that it was “good”. The word for “good” in Hebrew is “tov”. God had put all of God’s essence into what had been created. God is now inviting us to do the same thing. The keynote speaker and musical guest will be AGAPE. We will leave Zion at 5:00pm on Friday and return by 6:00pm on Sunday. The total registration fee is $75. Youth on the cleaning team are asked to pay $20 towards the cost of registration. Youth not on the cleaning team need to pay $50 towards the cost of registration. A detailed information sheet about costs and what to bring will be distributed with the registration forms at the January 10th youth/parent meeting. All forms must be turned in to Dana Lee by Wednesday, January 20th. Current 6th graders can attend this year! All youth in grades 6-12 are invited to participate in youth activities. For additional information contact Dana Lee Smith.